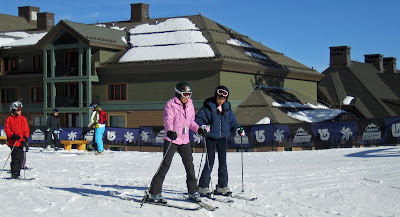 The Ritz-Carlton Highlands Lake Tahoe, sited at NorthStar California (previously NorthStar at Tahoe) was opened in 2009. It sits mid mountain with ski-in,ski-out access. It boosts 153 rooms, 16 suites and 4 other larger suites. Amenities include a pool, spa, fitness center, meeting rooms and valet parking. Pet friendly rooms are available upon request. The Conde Naste Traveler ranks the Ritz as the number 10 top resort in the US. I have never heard of Conde Naste, but it is apparently known to the "discriminating" traveler. Conde says guests are "coddled by the stellar service, kicking off their skis at the ski concierge area, ordering cocktails from the poolside hot tub, heated pool, fire pits", etc. I have visited the Ritz a number of times for drinks apres ski. Maybe it was just me and my friends, but each time we came away with the opinion: We payed how much for what service? Maybe the service is better at the poolside hot tub.